Dr. Rastogi is a Resident Physician and Dr. Villablanca is an Associate Professor, Department of Radiological Sciences, David Geffen School of Medicine at UCLA, Los Angeles, CA. 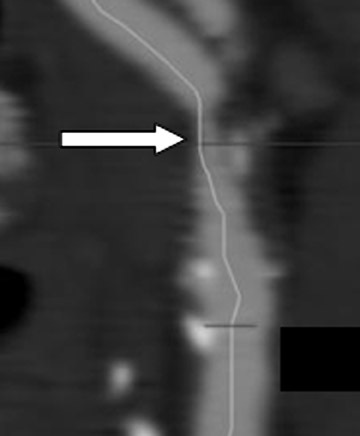 Computed tomography angiography (CTA) is a valuable tool for the evaluation of carotid artery disease. It has been used to detect early atherosclerotic changes within the carotid arteries, determine stenosis severity, identify the distribution and extent of atherosclerotic plaque, perform plaque characterization, and detect and characterize carotid dissections. Recent investigations have also explored its role after carotid stenting. The gold standard for the detection and grading of carotid stenosis has been catheter angiography. 13 However, Willinsky et al 18 reported angiography of the carotid arteries carried a 1.3% risk of neurologic complication, 0.5% of which can be permanent. In the Asymptomatic Carotid Atherosclerosis Study, nearly half of the morbidity/mortality rate (2.6%) was accounted for by the rate of stroke after DSA (1.2%). 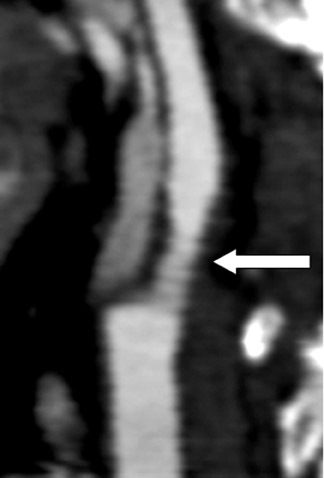 19 A desire for enhanced patient safety and lower study costs has prompted the development of noninvasive tools using duplex US, magnetic resonance imaging (MRI), and CT. All of these noninvasive techniques appear to be suitable for measuring stenosis of the proximal internal carotid arteries when compared with DSA as determined by a meta-analysis of studies between 1990 to 2001. 20 All of these techniques also show similar accuracy in the diagnosis of symptomatic carotid stenosis. However, each of these imaging techniques has its own advantages and limitations. Carotid US is a noninvasive, low-cost, and widely available modality, but it suffers from significant drawbacks. It is operator-dependent, and findings can be variable and difficult to reproduce. 21,22 Lee et al 23 showed that the variability of Doppler measurements in the common carotid artery (CCA) and internal carotid artery (ICA) in 85 patients without carotid disease is substantial and could lead to inaccuracies in carotid arterial stenosis measurements. They report that peak systolic velocity ratios exceeded 1.8 (suggesting ≥60% stenosis) in 14% of normal carotid arteries and that end diastolic velocity ratios exceeded a ratio of 2.4 (also suggesting >60% stenosis) in 15% of normal carotids. Despite its common usage, no universal table of measurement standards that reliably estimates the degree of stenosis has been established. Variability in velocity measurements along the course of the ICA also influences the interpretation of ratio parameters. 23 Peak systolic velocity has been shown to be influenced by relative position within the ICA, equipment type, technique used, and by physiologic factors, such as cardiac output and contralateral restriction of blood flow. 24 Another limitation of US is its limited FOV that renders the evaluation of tandem stenoses and vessel course difficult. The latter is particularly important, as kinked carotid arteries are better suited for CEA than for carotid stenting. 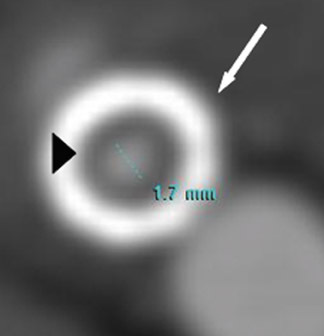 Lastly, heavy calcific plaque, a common finding in atherosclerotic disease of the carotid bifurcation, works as an acoustic curtain through which insonation is impaired. If the point of maximal luminal narrowing occurs within the calcified segment, forcing a sampling distal to the site of maximal peak systolic velocity will lead to an under-estimate of the percent stenosis. 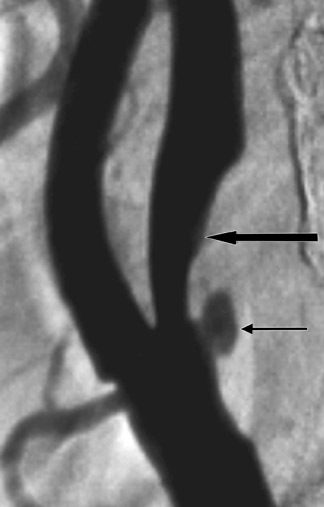 Multidetector CTA of the carotid arteries has been shown to be a suitable noninvasive technique for assessing carotid artery stenoses. 2,30-32 A meta-analysis of studies from 1990 to 2003 showed that CTA had a pooled sensitivity and specificity of 85% and 93%, respectively, for the detection of 70% to 99% stenoses. 33 Others report that patients tend to prefer CTA over MRA or DSA, 34 with US preferred by patients overall. In specific instances, MDCTA can also outperform DSA in the accurate depiction of carotid stenosis. With DSA, the standard of care is 2 or 3-view carotid angiograms, generally in the anteroposterior, lateral, and, occasionally, right or left posterior oblique projections. When a stenosis is markedly eccentric or elliptical and when the long axis of that ellipse is not along the beam path of these standard projections, the stenosis severity will be underestimated by DSA. This measurement error can be on the order of ≥25%, and could erroneously exclude an otherwise qualified candidate from CEA. The problem is not easily solved, as it is not possible for the angiographer to intuit a priori which precise projection will render the lumen in its narrowest profile. Hirai et al 35 recently showed that when the carotid artery lumen has a high long-to-short axis ratio, the luminal morphology may lead to erroneously decreased estimates of luminal stenosis by DSA (Figure 1). 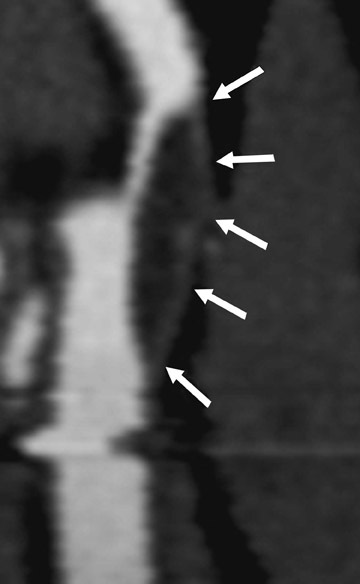 A possible limitation of CTA is the difficulty of measuring stenoses in a heavily calcified vessel. 25,36 However, numerous investigators have noted that with appropriate window and level adjustments, the blooming artifact from the heavy calcific plaque can be reduced, allowing for a more accurate quantification. 28,37 The major disadvantages of CTA compared with MRA include its use of ionizing radiation and potential for nephrotoxicity. 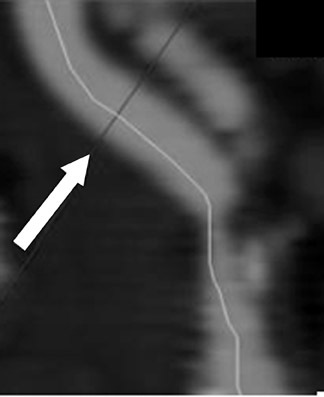 The NASCET criteria require measurement of the stenotic lesion at the site of maximal luminal narrowing and in the first normal distal arterial segment where the walls are parallel. 13,14,17 With the ECAS method, the stenosis is calculated by measuring the ratio between the narrowed carotid bulb luminal diameter and the native carotid bulb from wall to wall. Both methods can be reliably performed and reported using MDCTA. The axial or axial oblique CTA source images provide the most reliable stenosis measurements when comparing CTA with DSA. 2 In cases in which the vessel is tortuous, it is important to use the curved MPR to ensure true cross-sectional measurement perpendicular to the long axis of the vessel, and thus avoid artifactual luminal eccentricity (Figure 2). Appropriate window and leveling is also crucial when measuring carotid stenosis, especially when significant atherosclerotic calcification is present. 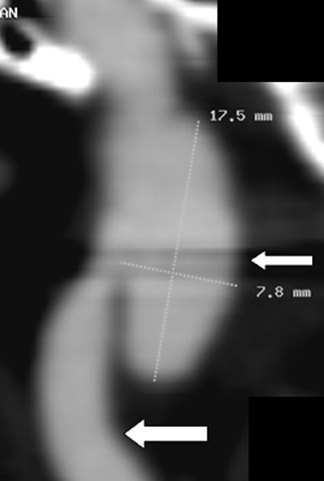 For the interpretation of axial or axial oblique source data, the authors recommend using approximate window and level settings of 1000 W/ 500 L. In an effort to simplify the measurement of carotid stenoses by CTA, Bartlett et al 28 have recently proposed the direct measurement of carotid bulb diameter and its correlation to the percent stenoses as determined by the NASCET criteria. According to their study, a carotid bulb diameter >2.2 mm corresponds to a <50% carotid stenosis, and a carotid bulb diameter <1.3 mm corresponds to a <70% stenosis. Although the risk of stroke has been most closely associated with the severity of carotid stenosis, 13-15 atheroembolic strokes are known to occur in patients with less than severe (<70%) stenoses, and conversely, not to occur in patients with known severe stenoses. 41 These findings suggest that carotid plaque morphology may play an important role in the risk of atheroembolic stroke. Certain plaque morphologies have been associated with higher stroke risk. Histologic characteristics associated with increased stroke risk include a large lipid/necrotic core, a thin or ruptured fibrous cap, plaque ulceration, intraplaque hemorrhage, and a dense inflammatory cellular infiltrate. 42,43 Preliminary studies suggest that CTA is able to provide accurate plaque characterization when compared with histopatho-logic specimens. 31,44 Through the use of Hounsfield unit (HU) analysis, CT allows for the potential characterization of plaque composition, specifically commenting on the lipid/necrotic core, fi-brous component, and calcification. Areas of the plaque that have HU similar to muscle have been proposed to likely correspond to fibrous tissue, whereas areas with low attenuation values are thought to represent the lipid/necrotic core. 31,44 A more recent study, however, questions the ability of CTA to characterize plaque morphology. 45 This suggests that additional studies are needed to determine the true capabilities of MDCTA in plaque characterization, particularly with respect to the identification of vulnerable or unstable plaque elements. Ulcerations, a known cause of thromboembolic phenomena from carotid atherosclerosis independent of stenosis severity, can be missed on DSA when the ulcer crater projects along the path of the X-ray beam. 46 Multidetector CTA is capable of excellent depiction of plaque ulcerations and arguably outperforms DSA in crater detection. 47 Because MDCTA is a direct contrast cast of the vessel lumen, it is generally superior to both TOF-MRA and US in the detection of ulcer craters (Figure 4). Prior work has shown that both Doppler US and MRI may be of value in the diagnosis of cervical carotid artery dissection. 57 Both techniques have significant limitations, however. The primary limitations of Doppler US are a limited scan coverage using conventional probes and the nonspecific and overlapping nature of the echo patterns obtained from dissected arteries. Helical CTA has also been shown to be a reliable method for evaluating extracranial ICA dissection, especially in the setting of trauma. 62 Leclerc et al, 63 in a study of 18 patients, found a 100% sensitivity and 100% specificity for both stenotic and occlusive dissections. 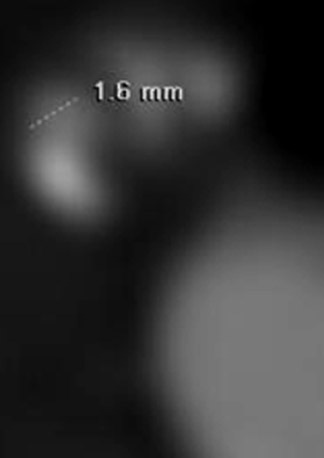 They found an analysis of the residual arterial lumen and the measurement of the external diameter of the carotid artery to be the most sensitive criteria for the diagnosis of CAD. Our experience shows that criteria more specific than luminal reduction and external diameter can also be used to establish the diagnosis of CAD. 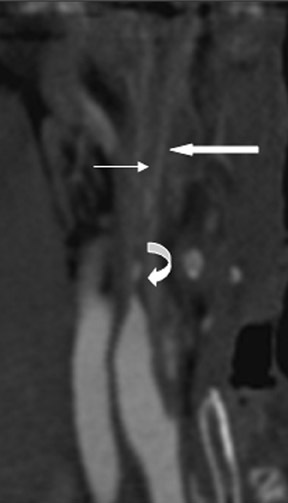 These include the presence of an intimal flap, the presence of an isodense eccentric or concentric intramural hematoma, formation of dissecting aneurysms, increased native arterial diameter, and luminal stenosis (Figure 6). It is our opinion that because MDCTA provides non-luminal information, the specificity of MDCTA for carotid dissection may in some instances be higher than that of DSA for carotid dissection when typical angiographic findings are lacking or ambiguous. In 1996, Egelhof et al, 64 in a study population of 21 patients with clinically or sonographically suspected extra-cranial carotid dissection, reported a 100% sensitivity and specificity of CTA as compared with catheter angiography. At our institution, we have found that direct MDCTA signs of arterial dissection do not require further diagnostic investigation to confirm the diagnosis. Specific CTA findings include an intimal flap, dissecting aneurysms, and mural hematomas, as described below. An intimal flap is a thin, hypodense band that spans the arterial lumen; it is generally oblique or spiral in nature and is of high sensitivity. Very thin web stenoses and horizontally oriented intimal shelves may be difficult to detect by MDCTA. Dissecting aneurysms appear as focal contrast-opacified outpouchings arising from the parent artery. 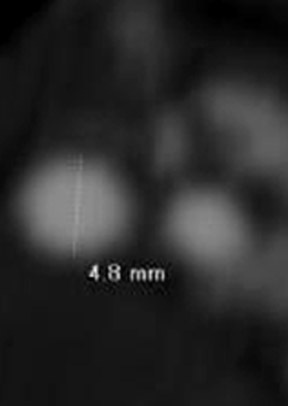 These lesions may contain intraluminal thrombus and may exert mass effect on the parent artery, which contributes to luminal reduction of the parent vessel. The sensitivity of CTA for dissecting aneurysms is very high (Figure 4). Mural hematomas can be iso- or hypodense to surrounding tissue, depending on whether they are acute or subacute in nature. The adventitia of the parent artery is clearly visualized peripheral to the hematoma. The hematoma may be focal or segmental, concentric or eccentric. 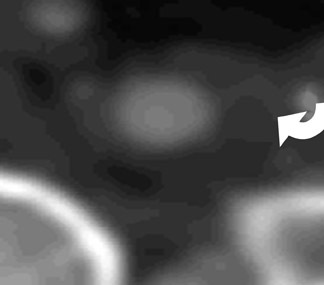 Using appropriate window and level settings, the detection of a mural hematoma is straightforward when using gray-scale 2D source or MPR images. Typically, patients with CAD are treated with anticoagulation for 3 to 6 months after the initial event to prevent thromboembolic events. 50 Approximately 70% of dissections heal spontaneously, and most pseudoaneurysms either resolve or significantly decrease in size. Only ≤15% of cases of CAD are noted to progress. 64 Multidetector CTA can be used to detect progression and document healing. Sources of measurement errors include a failure to use optimal window-level setting, stenosis measurements using MPR images nonorthogonal to the long axis of the vessel of interest, suboptimal contrast opacification, and the use of images containing gross patient motion. Failure to cover the entire region of interest may lead to incomplete visualization or characterization of relevant pathology or to false-negative findings. All studies should use automatic bolus detection technology to trigger helical contrast acquisition. Alternately, a timing injection can be performed in all patients. Multidetector CTA is emerging as a versatile and powerful tool in the noninvasive evaluation of a range of pathologies affecting the extra- and intracranial segments of the carotid arteries. Optimized scan and image acquisition protocols, high-quality image postprocessing, and a comprehensive understanding of the appearance of common pathologies and imaging artifacts will help ensure accurate lesion detection, quantification, and characterization. 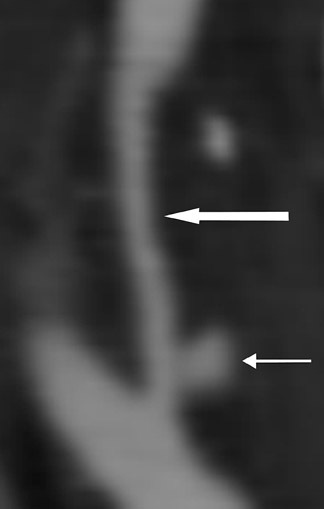 Multidetector CT angiography of the carotid arteries. Appl Radiol.